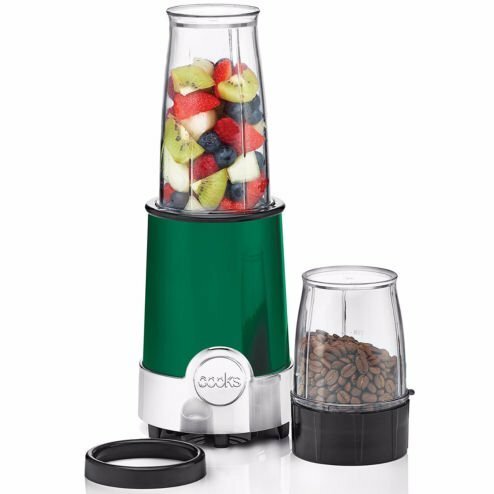 Shake up your kitchen routine with this 5-in-1 power blender from cooks. Whether you're whipping up a healthy smoothie or mixing and blending homemade sauce, every process is easier and more convenient with this 6-piece high-power blender. 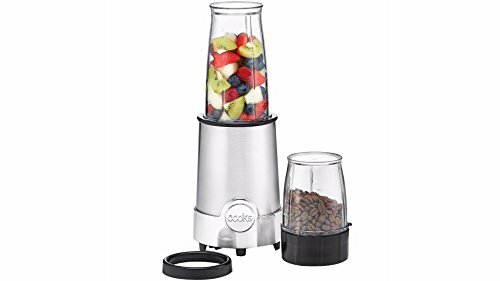 -stainless steel blades makes blending, whipping, chopping, -grinding and mixing effortless -drink directly from the blending cup with the comfort lip ring -includes quick and easy recipes -high-power base with a 120V, 60hZ motor 6-piece set includes: -high power base -13½-ounce blending cup -6-ounce grinding cup -comfort lip ring -stainless steel grinding blade -stainless steel blending blade -240 watts. Plastic/stainless steel. Hand wash base; blades and cups are top-rack dishwasher safe. Imported.